Looking for a great way to spend a late-summer Sunday afternoon? Take a leisurely walk, find some fun stuff, stop for a bite to eat and a cool beverage – what more could you ask? 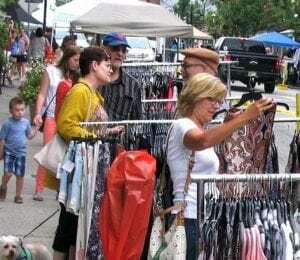 Just come out to stroll through Broad Ripple Village on Sunday, July 29, 11 am – 3 pm for the Annual Sidewalk Sale! Shop all of your favorite Village merchants for great buys and closeout deals! Participating shops include Alley Girls, Artifacts, Artistry in Clay, Athletic Annex, The Bungalow, The Blue Door, Clara K. & Cartabella, H. Josephine Home, Indy CD & Vinyl, Indy Urban Flea @ Hotel Broad Ripple, Lola Blu, Marigold Clothing, Playful Soul, and Runners Forum.